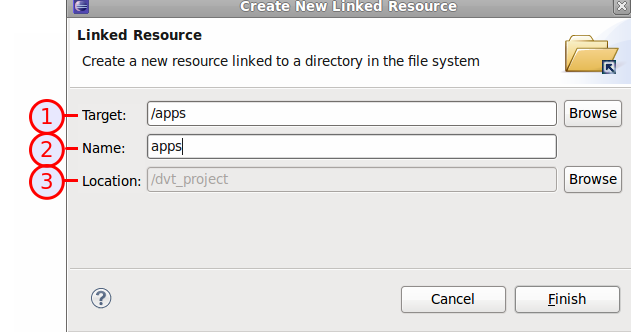 Linked resources are very similar with file system links, except they are registered in the .project file, not created on the disk. Location: location (inside the selected project) where the link directory will be created. in a terminal. This way you can share the project with your team and the linked folders will work seamlessly. Note: When you press Finish, if the directory the link points to is too big (for example it has more than 3000 children), a Resource Filter dialog will pop-up. You can use it to exclude those children that you don't need and that may slow down the platform (you can find out more about it here). 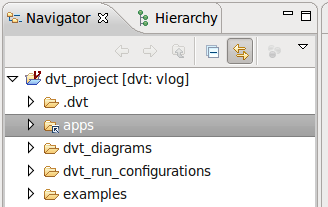 Tip: You can also use drag & drop from a filesystem navigator (like Nautilus in Gnome, Dolphin in KDE or Explorer in Windows): drag the external folder and drop it on the desired target location (Project or Folder) in the Navigator View. In the dialog that pops-up specify that you want to "Link to files and folders". A linked resource will be automatically created.